The FileMaker Platform is FileMaker Inc.’s new branding for the Apple-owned software house’s recently upgraded suite of powerful tools for database developers. FileMaker Pro, the platform’s desktop client and development hub, has reached version 13 and costs $329 for a single license, while FileMaker Server 13, the back-end file handler for networked database solutions, starts at $1,044 — with an additional subscription pricing structure we shall discuss later. FileMaker Go 13, the iOS companion app to FileMaker Pro, remains free. 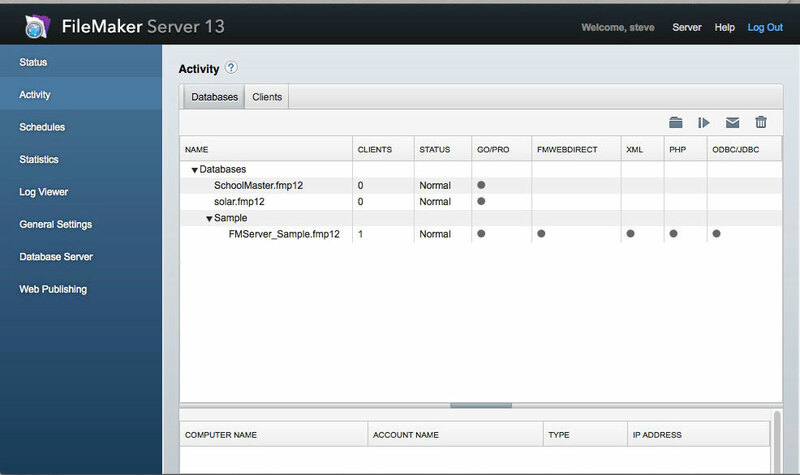 Direct to the Web… — The marquee feature of FileMaker Server 13 is WebDirect. The FileMaker Platform previously enabled publishing databases on the Web through Instant Web Publishing, a useful but dated technology that has now been supplanted by WebDirect, a more modern and dynamic system that essentially replicates the functionality of a database in a Web site. Existing users of Instant Web Publishing could be forgiven for thinking that it already ticked this box, but the improvements offered by WebDirect are substantial. While Instant Web Publishing dished up, in effect, a static HTML page each time a Web browser requested data from FileMaker Server, WebDirect exploits modern Web technologies to generate a dynamic page that much more closely mirrors in a Web browser the experience offered by the native FileMaker Pro desktop application. Data is now pushed by WebDirect’s Web server engine to Web browsers displaying a database, and the contents of a WebDirect window update to reflect changes made in a database by other users of the same database. In a test setup running FileMaker Server on a Mac mini and serving a database to two other Macs on a local network over Ethernet, a change made in FileMaker Pro on one Mac appeared in a Safari window on a second Mac within five seconds, while a similar change made within a WebDirect window was mirrored in a native FileMaker Pro window almost immediately. Changes to layouts, similarly, are reflected on client computers accessing a database through WebDirect. 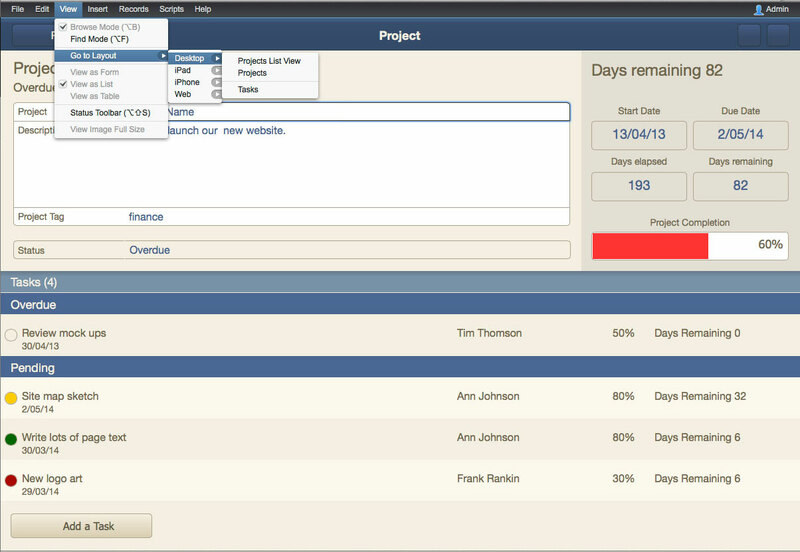 WebDirect users can also access most of the menus that are available in FileMaker Pro. Scripts can be triggered, but not edited, from the Scripts menu; records can be imported from external sources and exported from a database; and the Records menu allows navigation around the database in a manner similar to the desktop application. WebDirect is, then, an interesting and powerful technology that provides a means of interacting with FileMaker data remotely via the Web, and comes much closer to reproducing the full FileMaker experience than Instant Web Publishing did. As well it should — while Instant Web Publishing was a feature of version 12 of both FileMaker Server Advanced and FileMaker Pro, it has now been removed from FileMaker Pro 13. If you want to publish your FileMaker database on the Web, you’ll be using the much more expensive FileMaker Server. …For a Price — Fortunately, FileMaker Server 13 looks better and is more capable than in the past. 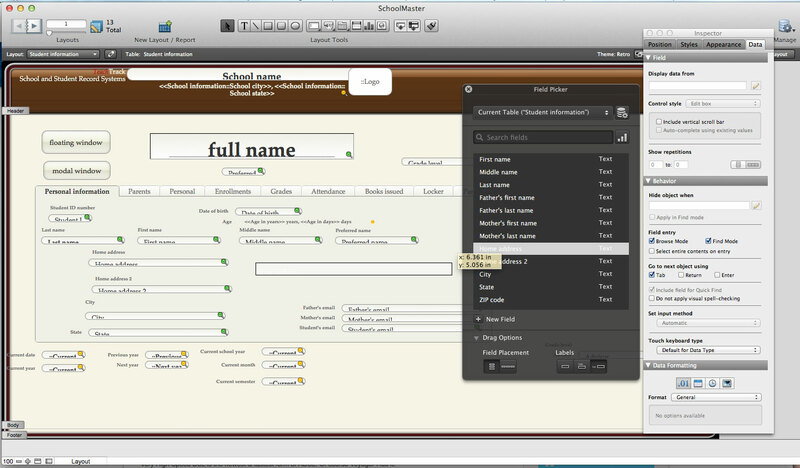 It is still implemented in Java, and still managed through a Web browser, but the interface is a little more polished than it was, and it is at last possible to upload a file from FileMaker Pro directly to FileMaker Server, a seemingly minor enhancement that, in fact, saves an annoyingly large number of steps. What requires significantly more attention in FileMaker Server 13 is the new licensing structure. A basic license for FileMaker Server, including one “concurrent connection” — a connection from FileMaker Go or via WebDirect — costs $1,044. This price is comparable to earlier versions, but the functionality it provides is surprisingly restricted. The number of users of the FileMaker Pro desktop client who can connect simultaneously is limited only by the hardware and networking infrastructure of the computer running FileMaker Server, but, unless additional connection licenses are purchased, only one connection at a time can come either from a mobile device running FileMaker Go or from a Web browser via WebDirect. Additional connections aren’t cheap — they are licensed in blocks of five, with each block costing $900 — that’s right, $180 per connection. What makes this even more confounding is the fact that Instant Web Publishing, while a significantly less brilliant technology than WebDirect, was a standard feature of the previous version FileMaker Pro, with version 12 of FileMaker Pro Advanced offering unlimited Web client connections at no additional cost. WebDirect is, make no mistake, an impressive bit of functionality, but its sweetness is soured somewhat by its price. When you compare the $329 cost of a full install of FileMaker Pro (even with volume discounts) against the $900 price for five additional concurrent connections, the attraction of WebDirect wanes somewhat for network access within an office. For instance, six copies of FileMaker Pro will run you $1,944, whereas the 10 FileMaker Server connections necessary to serve six users will run you $1,800. WebDirect is a better deal, though less so at the lower end of each five-user pack, but a savvy network manager may want to mix copies of the more capable FileMaker Pro with concurrent connections to WebDirect for most efficient budgeting. Regardless, if you need to provide database access to Internet users without requiring additional software, or if you want to offer mobile access to your database via the free FileMaker Go 13, you’ll be paying for those concurrent connections. They may run you more than in the past, with Instant Web Publishing, but that’s the cost of progress, I suppose. Increasingly Polished Pro — Moving on from the FileMaker Server-specific WebDirect feature, many of FileMaker Pro 13’s updates revolve around design and layout of database solutions. While enhanced layout backgrounds and padding within layout objects are useful, they’re not earth-shattering. Similarly, the Field Picker, a floating palette that allows data fields to be dragged directly onto a layout, is a somewhat more efficient layout process than the previous process of drawing a field object and then specifying a field for that object. Undo after save is more useful — it is now possible to undo changes to layouts after saving them, and even after leaving Layout mode and then switching back from Browse Mode. The genuinely valuable new design features of FileMaker Pro 13 are more subtle. Object visibility, for example, is now a property that can be managed via calculations, so a red “Account now overdue” alert might become visible only if a balance is negative or a date has passed. Similarly, dialog buttons and tab controls can now be specified via calculations rather than being hard-coded into a layout, allowing additional flexibility in layout design. Layouts for iPhone and iPad can now include sliding regions, which might best be described as a cross between tabbed panels and desktop spaces — a finger swipe across the screen displays the next panel to the left or right. Other improvements include enhanced script triggers, more powerful Get functions, barcode scanning, and data encryption, though this last one is essentially a catch-up. None of these features are revolutionary in the way WebDirect is, but depending on your particular needs, they may be either truly welcome or just unnecessary polish. Formats and Upgrade Anxiety — One cannot review a new version of FileMaker without talking about file formats. The transition to a true relational model with the release of FileMaker 7 broke many FileMaker solutions, and created both enormous headaches and numerous business opportunities for developers who built a small industry around the often arduous conversion process. Version 12 saw another new file format, but one that simply enabled new design features and left the underlying data structures unbroken. The good news for all except developers specialising in upgrade conversion is that file structures again remain intact; version 13 of the FileMaker Platform generates .fmp12 files that can be served and read by both versions 12 and 13 of FileMakers Go, Pro and Server, with both versions happily sharing a network. Cloudy, with a Chance of Savings — In the end, possibly the most remarkable aspect of the new version of the FileMaker Platform is the pricing and licensing scheme. In addition to the pricey “concurrent connections” idea that makes WebDirect a non-trivial purchase, FileMaker, Inc. implemented a monthly licensing option similar to Adobe’s Creative Cloud system, but with a more attractive pricing structure (see “Creative Cloud Complaints Darken Adobe’s View of the Future,” 17 May 2013). A single purchase license of FileMaker Pro, for example, costs $329 and even an upgrade from FileMaker Pro 10 or later costs $179, while an annual license costs $108 — that’s 33 percent of the purchase price and 60 percent of the upgrade price. FileMaker Server, similarly, can be bought outright or licensed as part of a subscription, with the full purchase again costing the same as three years of licensing. With new versions of FileMaker products arriving roughly every two years, a strong case can be made for leasing, rather than buying. The assumption, of course, is that each of those biennial updates is sufficiently compelling to warrant an upgrade. With first Adobe and now FileMaker, major software houses both, offering subscription-based software licensing, it’s clearly a model that is here to stay; FileMaker’s pricing structure makes this new development much more palatable. With the ongoing licensing becoming a rather appealing option, my recommendations are as follows. Download FileMaker Go 13 for free. Either buy an upgrade to FileMaker Pro 13 if you already own it or license it annually if you don’t. As for FileMaker Server 13, if you’re already using version 12, given that versions 12 and 13 can coexist, just stick with it unless WebDirect is compelling for your use case, at which point FileMaker Server 13’s subscription pricing is worthy of consideration. It is unfortunate indeed that there is a lack of general purpose database solutions for the Mac for the casual user that does not require paying several hundred dollars every few years or learning how to be a programmer to use such offerings as SQL Lite. Hopefully the Base module in the free Office replacement product, LibreOffice will become more user friendly in the future with good documentation and examples to give all Mac users this choice. Unfortunately the annual licensing is only available with 5 or more licenses, as it is part of FileMaker's Volume Licensing scheme. This wasn't clear to me from their website, but they clarified via support. I only want two copies, so this is a shame.